Material - very well organize with good illustration of excellent examples. Presentation – instruction has delivered the message clearly with interaction and participation from class. Very dynamic and has made the class very interesting through out the entire period. Environment - very well organized and conductive in summary, the class is extremely interesting, full of theories, application, knowledge, relevant examples, solution and opportunity presented to all for questions and clarification. Truly enjoyed the whole session, this is no doubt I would strongly recommend those interested in Bazi to study with Joey. Feng shui master: a straggly, white-haired samfoo-clad old man gripping a geomancy compass, encircled by bottles of snake oil and a cloud of intoxicating incense, sitting in a dark corner of a temple? And what sort of sifu looks like a freshly scrubbed ketua pengawas and calls himself “Joey”, anyway? Aren’t they known as “Dragon Master” whatchamacallit? 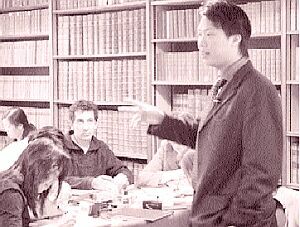 Joey Yap conducting a BaZi class in England.- Picture by Christopher Leong. My scepticism was perhaps an indication of the scorn most of us heap on professed feng shui “experts”. But Joey Yap – researcher, practitioner, consultant and scholar of feng shui, founder and CEO of Yap Global Consulting – is hell-bent on correcting our misgivings. At 27, he’s probably one of the youngest feng shui consultants out there. (“And,” he says, “if I may modestly put it, the one with the most students.”) He also runs three other internet-related companies, which, given his relatively young age, made this cynical old crone wonder: What’s your problem? With five successful businesses under your belt, why feng shui? I see this in your future . . .
Because it all began with feng shui, that’s why. Professing a childhood love of “Chinese metaphysics”, and seeking “foresight”, the kid who was supposed to be an accountant began studying the “mysteries of the unknown” 10 years ago with a Master Chan, a local feng shui sifu whom he credits for introducing him to the art at a time when there were no books. At university in Australia, Yap started consulting on a professional basis (“People started asking me to do it once they found out I knew feng shui. I made a comfortable living!”), and created a website, Chinese Feng Shui Consultancy. His consulting fees paid for classes with feng shui masters in Hong Kong, which he attended during term holidays. Yap admits that he never thought about going into feng shui consulting full time, but consultations snowballed after he returned to Malaysia in 1998. “It made me think, ‘If I’m going to do this, I’d better do it properly’, otherwise I’d just be another fortune-teller,” he recalls, citing how feng shui consultants tend to be considered “lower class”, or branded as charlatans, no thanks to the promulgation of hocus-pocus. He strongly objects to the belief that wearing a particular trinket or colour will enhance one’s luck. “Feng shui knowledge is not product-based,” he stresses. Yap relates another instance when a distressed woman rang up after her goldfish had died. The goldfish, she believed, was supposed to absorb her bad luck; was its death proof that she had just too much to handle? Yap told her perhaps she should have changed the water more often! Likewise, the numbers four and eight – abhorred and adored by superstitious Chinese – have nothing to do with bad or good luck. As Yap explains, “They’re just homonyms. All this phobia is just superstition.” Thus, instead of joining the swarm of happy couples getting married on supposedly propitious dates like August 8 (8/8), Yap says a truly auspicious date would be one that is in harmony with the bride and groom’s times and dates of birth, which can be divined through BaZi (a specialised branch of feng shui that analyses a person’s destiny). Nor should one be fooled into thinking that proper use of feng shui will turn one into an overnight millionaire. “Joey Yap says no such thing!” Yap declares. Luck (or “peak performance”, in Joey Yap-speak) in feng shui, it would seem, is something that is highly personalised. And how else does Yap plan to dispel the hocus-pocus? “Treat what I do as a respectable business,” he determines. “I want to disseminate important knowledge professionally and systematically.” The courses developed by Yap, will certainly see to that – no more skulking around temples. What’s more, Yap also founded Yap Global Consulting (YGC), his own personal and separate company, in January this year. (It’s really Chinese Feng Shui Consultancy in a new form.) If the School takes care of education, YGC is tailored for the corporate line, and thus is managed like a pinstriped, power-suited public listed company. A team of consultants audits different-sized “projects”, with Yap handling the more difficult “cases”. They brainstorm regularly for the best possible solutions, write reports, and even have client files with progress reports, an online system, newsletters and websites that answer questions and address various aspects of feng shui. Not your traditional feng shui consultancy, to be sure. Even the methods of payment are professional. Yap chuckles: “The traditional fee for feng shui advice is an ang pau. But if your client is a big multinational company, how are they going to pay you an ang pau for a consultation? So I invoice them!” Other creative terms include “Consulting: Interiors and Design” (office reading and layout) and “Personality and Behaviour Profiling” for BaZi (which, in addition to purportedly chart destiny, is also used to identify trait and character according to time and date of birth). If it doesn’t work . . . well, like any consulting firm worth its salt, there should be follow-up – a consultation is not a one-off, after all. No, not even in feng shui. In addition to reinventing the image and commerce of feng shui, Yap is also changing the way feng shui knowledge is obtained. His Professional Feng Shui and Homestudy series cover various branches of feng shui – BaZi, face-reading, astrology, palmistry, you name it – all delivered with the same brand of professionalism. The difference is that there’s no meditating at the feet of a master here; Yap’s classes are about a systematic syllabus, detailed workbooks, and slick multimedia presentations. Yap observes that “the Western concept of feng shui is that it’s a placebo, so there’s a niche in this,” i.e. debunking the gobbledygook and imparting the “truth” about feng shui. In that respect, Yap turns the white guru stereotype on its ear: a Malaysian export teaching a very Chinese subject to a predominantly Western audience. I quibble with him over his rates. He adroitly justifies: “I don’t see it as an altruistic thing. Even with friends I don’t do free consultations. Free advice can be the most expensive, because I’ve not studied their problems, I’d just be giving out a free tip based on a few pointers. In comparison, Yap dispenses advice at joeyyap.com and masteryjournal.com for free; and instead of waiting to be approached, takes the knowledge to the students (he has 38 international schools, and some 3,000 students worldwide). The biggest challenge in this line of work, Yap acknowledges, is his age. “I get the comment, ‘You don’t have white hair’ quite a lot!” he laments. “But I don’t need white hair for results – judge me by my results and professionalism and commitment, not my age. I don’t feel inferior now – I used to, but now I’m more comfortable. The main challenge is my age; it’s hard to build the company name and trust with clients when they see how ‘old’ you are. Yap also has his masters to contend with. “Some of them aren’t too happy that I’m doing this because they think I’m changing the traditional way of learning – 30 years and all that – and that I’m teaching it too easily,” Yap sighs. “No disrespect to them, but I believe one should help others get that knowledge. Not everybody can sit down and learn for 30 years! If this knowledge is available, why should the world miss out? But for those who want to follow in his footsteps, he has this to say: “Firstly, continue studying the essence and formulae of feng shui. Say no to blind faith and question everything. Don’t just accept concepts, study the classics to find out their true meanings. Do not accept things at face value, for every application has a sound theory, historical reference and logical process. Next week: Our reporter gets busy with BaZi, and talks to Joey Yap’s little band of student groupies. For details about Joey Yap, please call +603-2284-1213 .